Hi all, I believe you already know about dofollow link. Dofollow forums can help to make it possible. If you are a newbie and don’t know about dofollow or nofollow attributes, you can read my previous post about dofollow vs nofollow. Today, I am sharing a dofollow forums list. 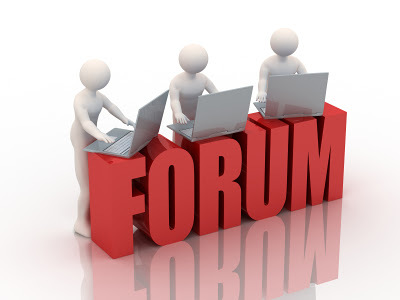 Select few of the forums based on your niche and create an account on them. Once you are registered, have a signature and use your’s blog URL in it. Each Forum has its own rule, few of them will allow you to create signature, only after 30 post. Best thing is to check the FAQ section of forum before registration. I believe, above discussion was little bit boring :P, please forgive me. Here is the list. Note: Please read below mentioned points. I committed few mistakes, while building backlinks and it caused me trouble. I had created account on few of the forums and started leaving my URL at the end of each post. After one day, I got 2-3 warnings from moderators, they even scared me that they would block my account and IP address :(. I admitted my mistakes and gone through FAQs to avoid further issues. The moral of the story is, consider below points to avoid any mistakes, which can get your account blocked permanently. 1) Don’t paste any external link, while posting, instead use signature with your’s blog URL. 2) Please go through the forum’s FAQ before leaving a post, it will give a better picture of what to do next. 3) Choose 2-3 forums and be active on them as some of them may remove inactive members accounts. There are many more other forums, however Its not possible to be active on all, better option is to choose few of them, which suits your niche. Even I am active on few of them. Along with backlinks, forums are the best way to bring traffic towards your blog. Each forum has moderators so please don’t try to spam there as if they catch you, you will loose your membership. Post quality content and build good relationship with the forum community. If you have any questions regarding this, feel free to leave a comment below. You can also contact me, via contact-us form. If you are member of any of the dofollow forums mentioned in the above list and faced any issues, share with us through comments so that others get to know about it. If you like the post and wants to stay in touch with us, then you can join us on facebook and Gplus. Also you can subscribe below for free email updates. Thanks for this list of do follow forums. I did not realise that the Warrior Forum was do folow one as well. Thanks for this list. Thank you Chaitanya for making this valuable post, i will surly use your forum list for link building. Thanks for provide dofollow forum backlink list for good traffic. One of the best articles about backlink. It is very Useful for us. Thanks For sharing do follow forums site list ! Thanks for sharing high PR do follow list. I will, definitely, be bookmarking this page for future reference. Very valuable and informative post. Thanks for trhe wonderful list of dofollow forums list, Really needful for ever blogger to build backlinks. Thanks for the list. I have checked a couple of the forums and have confirmed the majority of them are dofollow. Thanks Chaitanya for sharing your knowledge and do follow list …….. Thanks for sharing this. This list is very helpful to increase the visibility of the site. Thanks for sharing such terrific list of dofollow forums with us webmasters. We are also a dofollow forum! We would love some new members (as well)! Your forum posting list is excellent. It will really help me to increase my backlinks and guidelines are very clear.